I knew I would have to get up on the earlier side in order to catch up on some of the miles I missed yesterday. Of course, waking up is always tough for me. The mosquitoes and flies buzzed around me as I ate my breakfast, making the first part of my day even more unpleasant than it already was. My morning began with the continuation of the climb I had started the night before (I actually had at least 2/3 of it go). On my way, I saw the section hiker I met at the Callahan’s packing up his camp, and then at the top of the climb, found another hiker I did not know taking a break. The trail remained in the forest and offered nothing spectacular in terms of scenery. For a moment, I saw Ole and Track Meat, who had just emerged from a side trail, presumably to collect water, but they sped away as we started the next climb. I stayed within my own means and rhythm and did not try to catch up to anyone. After ten miles of hiking, the guy I did not know, named Wall-E, came along during one of my short breaks, asking where the spring was. I told him that we should find it any minute now. A sign on a tree further up ahead pointed down to it and we were both relieved that we had not passed it. Water was scarce in these parts of Oregon! Because we had different methods of filtering water, we were both able to collect at the same time in different areas of the small pool. While I filtered, the section hiker came down and kept loudly asking where the spring was. I found it odd that he couldn’t see the water directly in front of him. As he complained about his shoulder pain, I left Wall-E to commiserate with him and headed back to the trail and to my own space. Soon afterwards, I came across 4 men, taking a break. They were speaking to each other very loudly. I had no idea which direction they were hiking, but quickly learned they were also headed north. I found a secluded spot off the trail to each some lunch and make myself an ice coffee. The bees wouldn’t leave me alone, however! They swarmed me at every break I took. I watched the men pass by, still loudly interacting. Not long after, I saw a women and a couple taking a break. I assumed the couple was the same one I had seen yesterday, and as the woman was looking in my direction, I said hello to her first. Then, the female of the couple came running over to me and threw her arms around me. It was Wildcat and Baxter, who I hadn’t seen since Kennedy Meadows. “You caught us!” they yelled. I smiled. I felt like I had been slowly gaining on people whose names I had been reading in the registers ahead of me. I told them about my sicknesses and Susan, their friend, asked me some questions to help determine if it was really C. Dif. that I was suffering from. From my answers, she agreed that it was. 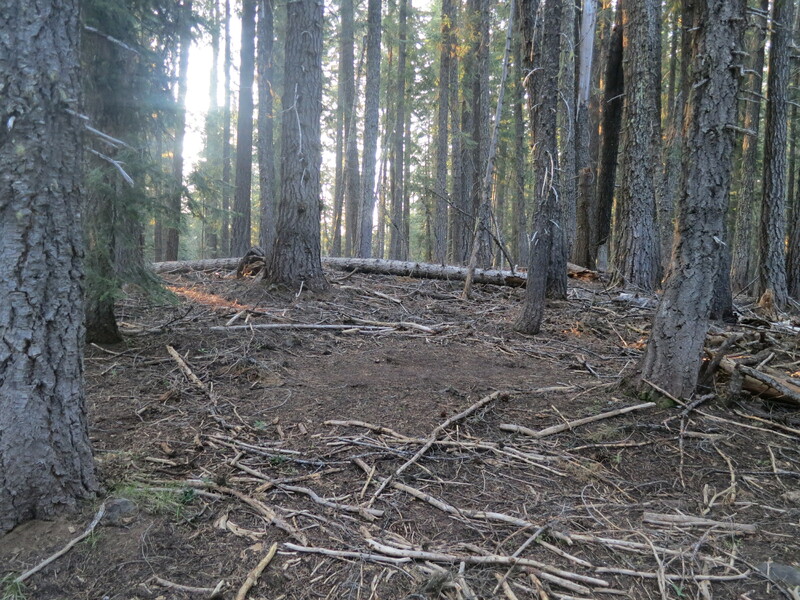 We talked about our projected finish dates and when we planned on arriving at Mazama Village. Before I headed out, Wildcat said that she was still carrying her essential oil kit and offered me the one for digestion. “Maybe it will help!” she hopefully offered. I told them that I had to get going to stay ahead of the annoying hiker behind me and zoomed off. Wall-E came along and also wanted to know what mile we were at… We ended up leap-frogging each other for a bit, as we took our little breaks at different times. I wondered if we would be close enough to take each other’s photos at the 1800 mile mark, but he stopped to make a phone call just short of that point. So, I took a picture of the marker itself and moved on. The trail climbed and I grew more tired with each additional mile. I stopped to take a snack break and then put in my headphones for a little extra boost. A couple of boyscouts headed towards me, wanting to know how close the upcoming intersection was. The trail continued to climb for several more miles. as I made my way down, I came to a nice creek and then saw the beautiful tent site that Baxter and Wildcat planned to stop at. They were not planning on making it to Mazama Village until the morning after tomorrow. I wanted to get there by late afternoon, which meant I had to hike as long as possible tonight. There were a series of small creeks ahead, the last at which, I would need to stop and fill up on water. The next 21 miles were said to be dry. As I approached this last creek, I looked down to see a tiny frog spring across the trail. I carefully stepped around it only to see another one just ahead. Again, I placed my steps carefully. All of a sudden, I saw many jumping frogs in front of me! They were all over the place! I set my pack down on the slope of the trail and brought my collecting bag to the streaming water. I started a boil for my pasta dinner, figuring it would be wise to eat here and not carry the water to immediately use in a couple of miles. As I filtered my water and ate my dinner, Wall-E came along. 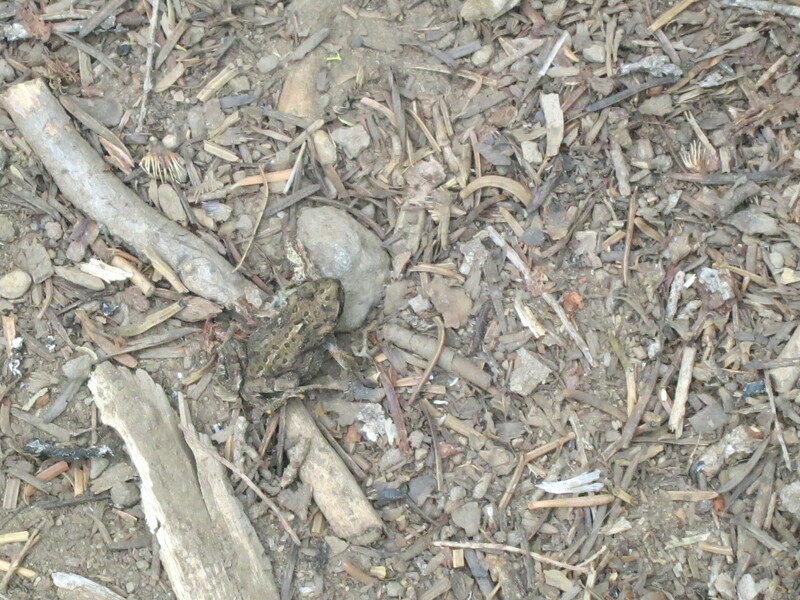 I watched him look down at the ground and stop at his first frog sighting. He took another step and then had the same reaction as I had had at the great number of them! He crossed the water and put his pack down across the trail from me and exclaimed about how tough the latter part of the day was. He wanted to know if this was the last water source we would come to today. Several minutes later, another hiker came along. He, too, had the same reaction to the frogs! It was amusing to watch. After he crossed the water, he stopped to ask us our names. He thought for a couple of minutes and then asked me if I had gotten lost in the Sierras. I shook my head no. He mentioned something about Bear Creek, and still I said no, I didn’t get lost there. He then said he was probably getting me confused with someone else. After thinking about it for a few minutes while he conversed with Wall-E, I realized he was talking about my early attempt to cross Evolution Creek. “Wait a minute… Yes, that was me! I was in a bad mood, then!”. I asked him what his name was and he said, “Commando.” He was aiming to hike several more miles this evening to camp along a side trail with water access. He headed on, followed by Wall-E who had scoped out this area for a place to camp, but didn’t see one. I was the last to leave. As the sun went down, I started to look for my own spot. I ended up moving a little ways ahead after my first possibility, finding a better flat spot there. I set up my cowboy camp and, for the first time on this hike, decided not to wear my thermal bottoms because it was too warm out. I tried to write down a few notes from the day, but the mosquitoes were vicious. Instead, I closed my eyes and tucked myself into my sleeping bag. Suddenly, I felt something crawling up my bare thighs! I swatted at my legs, only to feel it again! Ants had somehow gotten into my sleeping bag! I probably only felt them because my legs were uncovered! I got up and swatted them off. A couple of hours later, at around 1 in the morning, I heard a giant roll of thunder rip through the sky like a jet engine. My eyes opened wide. Was that really thunder and if so, do I need to do something about it? A flash of lightning lit up the sky. I guess so. My heart began racing. I had to dig out my crumbled up tent that had been resting at the bottom of my pack, unused for hundreds and hundreds of miles. Did I even know how to set this thing up anymore? In the dark, I worked as quickly as I could, talking myself through the steps. Rain drops fell on my stuff sacks and sleeping bag. I hurried as fast as I could and then threw everything inside the tent and lay awake, listening to the thunder and rain, hoping that I had set up the tent well enough to stay dry. Was Commando still hiking wearing a skirt? 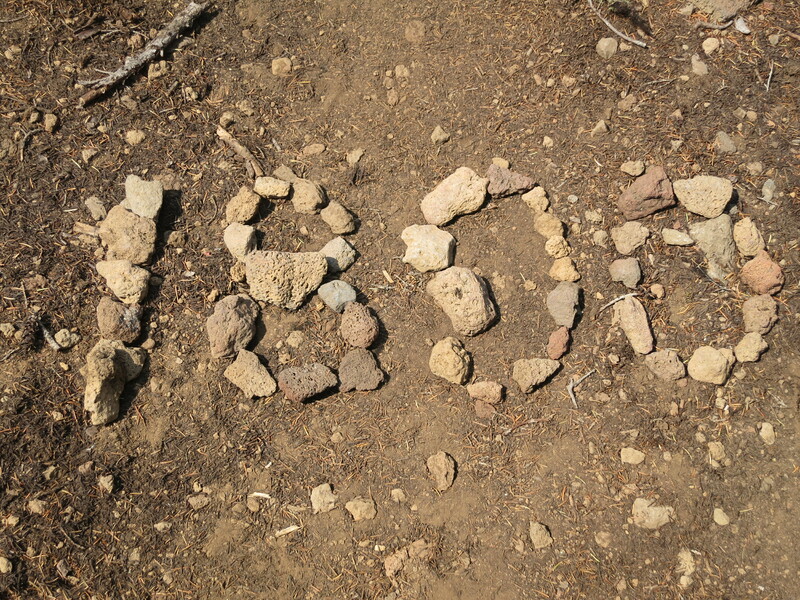 He was when I met him 4th of July weekend at the intersection of the PCT and Tahoe Rim Trail, just above Tahoe City. Yes, I believe he was wearing his tan kilt.